Home » Health » How Do Dental Implants Work? If you lose a tooth, whether by age or by accident, you immediately go to the dentist to find a solution. You don’t want to go around smiling when you don’t have the proper front teeth because it is embarrassing and will diminish your self-esteem. Advancement in the field of dentistry has resulted in various methods and alternatives being introduced that are used as replacements for missing teeth. However, over time, it has come to light that dental implants are simply the best option that can be used by people in this scenario. Basically, a dental implant is a metal frame or post that’s placed in the jaw for holding an artificial bridge or tooth. According to Dr. Vinograd from Brighton Dental Implants, “once dental implants are installed, these implants are able to function and look like natural teeth and are able to last anywhere from 10 to 20 years as long as they are properly maintained”. When they have to receive a dental implant, most patients work with a periodontist as well as a dentist. However, not every individual is considered eligible for getting these implants. Only people who have enough bone structure and healthy gums for providing support to the implant will be considered. Another issue is that these implants can be expensive if a lot of teeth need to be replaced and insurance might not cover their cost. Endosteal and Subperiosteal are the two types of implants that are used popularly nowadays. The most common ones are endosteal implants, which resemble a small cylinder or screw and are placed into the jawbone of the patient. Once placement is completed, about two to six months are needed by the implant to bond together with the bone and form an anchor that’s stable enough for an artificial tooth. During this time, it is possible for individuals to wear a temporary tooth replacement on the site of the implant. A second metal post may also need to be attached to the implant, depending on the type of endosteal dental implants that may have been used by the periodontist. Abutment is the name given to this post and the foundation on which the artificial tooth has to be placed is completed by it. After the installment of the abutment, a few weeks are needed by the gums for healing purposes. 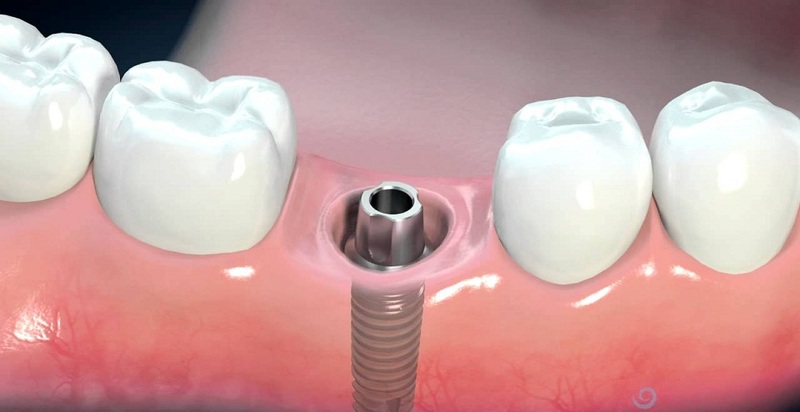 Such an implant can also be used by the periodontist that has an abutment extension already attached to it. It is not necessary to perform the second installation step in this case. Now, it is time for the dentist to create an artificial tooth that will be able to fit on top of the implant in a secure way. The tooth will have the same shape and color as that of one’s natural teeth. These implants are considered to be excellent alternatives to bridges and dentures. This is due to the fact that they can be used for replacing one tooth or even a group of teeth without having any negative impact on the neighboring teeth. Dental implants remain fixed in place and they will not shift or slip in the mouth and case any discomfort.